One of our favorite places to visit for a weekend seaside adventure is Jekyll Island, Georgia. If you’ve never been there, you’re in for a simply charming beach escape! We absolutely love Jekyll Island as the perfect tranquil getaway to slow down and catch our breath but also be leisurely active. It’s almost like going back in time, and it’s a place that’s escaped the mass development that so many coastal places have been through. No high rises, skyscrapers, or even condos more than a few floors! 1. Take a long walk along Great Dunes Beach looking for treasures at low tide. Sand dollars: if their hair-like cilia on their underside don’t move, they’re dead and you can take them; otherwise, put them back in the water. Seashells: check inside to see if there is a resident. Sometimes the resident will be soft and muscular with a hard plate attached (the actual creature that makes the seashell), and sometimes it might be a leggy and clawed hermit crab that uses an empty shell for protection. You can take empty shells without a resident for your collection. 2. Play golf at the Jekyll Island golf club. Three beautiful courses, and each round reveals a different array of wildlife: deer, heron, osprey, and even gators. We’ve even had deer and heron sightings right in the middle of the fairway! 3. Eat local seafood on the dock at Rah Bar or inside for a fantastic view of the marina at Latitude 31. 4. Check out the Jekyll Island historic district to see how the original wealthy Jekyll Islanders rolled. You’ll find their summer cottages, the famous Jekyll Island Club Hotel, the marina, and horse stables, all restored to their original luxurious condition. 5. Rent bikes and tour the island. See famous landmarks of Jekyll Island’s history, beautiful salt marshes, and enjoy riding on gracefully shaded paths under the trees. 6. Go to Driftwood Beach. You’ll find some spectacular specimens of driftwood here that give the perfect photo op. 7. Visit the Georgia Sea Turtle Center for a museum and up close view of rescued sea turtles. You’ll see live sea turtles who are being helped by this amazing organization, along with interactive and informative exhibits that all ages will love. 8. This one isn’t on Jekyll Island, so think of it as a bonus tip: Take a 30 minute drive to visit St. Simon’s Island for shopping and more restaurants. There is also a lighthouse to visit and rows of seaside shops. You’ll also find some fantastic eateries that serve locally caught seafood. The next time we go back to Jekyll Island, we’d love to do a horseback ride or carriage tour, and also go on a kayak tour. If you have kids, the Summer Waves water park is a great way to stay cool. There’s also a great mini-golf course that is so much fun! If you are a birdwatcher, hunter, or fisher, Jekyll Island offers great opportunities there too. 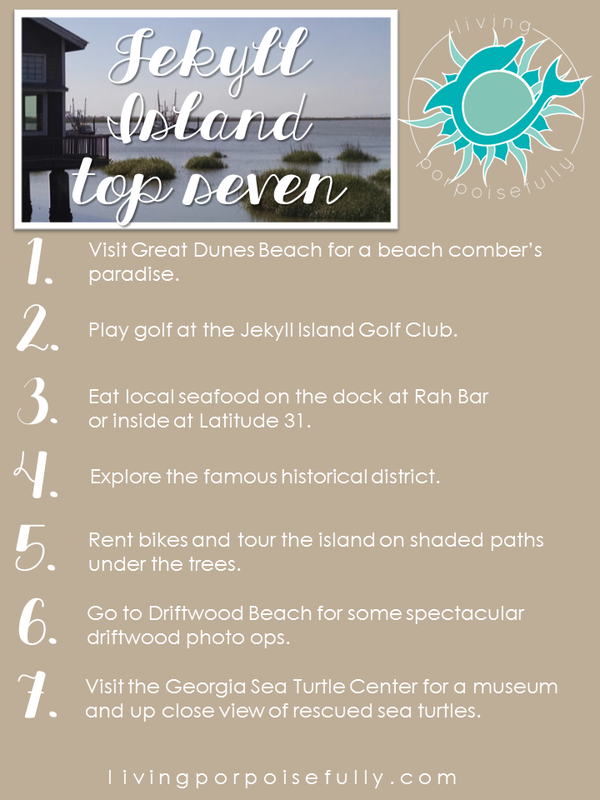 Jekyll Island is a seaside retreat that’s been kept off the beaten path, and that’s why we love it! If you’re looking to catch your breath in a tranquil setting, but also have the chance for being leisurely active, Jekyll Island might be just for you. Enjoy, soak it in, and feel the recharge that places like Jekyll Island can give! P.S.- Want to get on planning your trip? Here’s the Jekyll Island website to help in planning your adventure: http://www.explorejekyllisland.com/index.shtml.